In addressing the challenges men face as “traditional,” the American Psychological Association left itself wide open to a cynical binary attack. By now, anyone with internet access knows the American Psychological Association has released its Guidelines for Psychological Practice with Boys and Men. This is because the way the guidelines are framed has ignited a firestorm of (mostly) male anger across social media. Those who intentionally seek to undermine a more holistic approach to men and manhood, are gleefully pushing the narrative that the APA’s guidelines seek to erase “traditional masculinity.” For some, this is what the guidelines appear to be saying. This binary inducing vulnerability could have been avoided. The APA’s guidelines reference “a particular constellation of standards,” implying a unity of intention in how men perform traditional masculinity. But just as there is a wide spectrum of masculinities in the subset of gay masculinity(s), so there is a wide spectrum of masculinities in the subset of traditional masculinity(s). There is a monolithic and destructive agent at work here. Man box culture is enforcing a narrow and limiting version of manhood, bullying boys and men into lives of dangerous social isolation. The APA tiptoed up to the edge of naming the man box with their language “traditional masculinity ideology” but failed to differentiate its singular agency and location (culture) in relationship to the full spectrum of masculinities (identities). 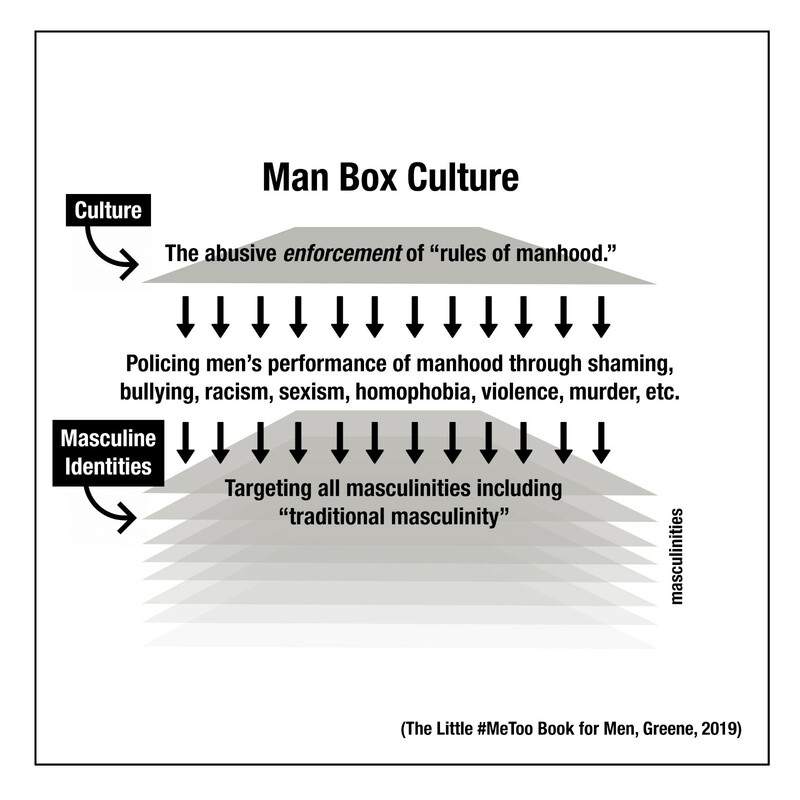 Man box culture is not a masculinity, it is a cultural agent which acts on, distorts and damages masculinities. The conceptual origins of man box culture date back to the 1980’s, when Paul Kivel, Allan Creighton and others at the Oakland Men’s Project developed “the Act Like a Man Box” in their work with adolescents in public schools around the San Francisco Bay Area. In 1992, Kivel documented their workshop process in his book Men’s Work: How to Stop the Violence That Tears Our Lives Apart. As Kivel explains, it was here that they first framed their man box concept. As such, man box culture refers to the enforcement of a narrowly defined set of rules for being a man. These rules are enforced through shaming and bullying, as well as promises of rewards, the purpose of which is to enforce conformity within our dominant culture of masculinity. The rules to which men are expected to conform can shift and change, and often do because the actual purpose of the man box is to create an ongoing state of uncertainty for men through bullying and enforcement, ensuring a hierarchical pecking order of control. The rules, some of which are sourced from traditional manhood, are actually secondary. The man box and the global awareness of it today due to the work of men like Tony Porter of A CALL TO MEN, makes it surprising to me that the APA didn’t consider some of Kivel or Porter’s concepts as a way to adapt a more culturally centered frame. If the APA had presented their efforts as addressing man box culture instead of pointing to a particular category of masculine identity, the launch of these important and useful guidelines might have been less volatile. This is because language that critiques culture (the act like a man box) is received differently than language that critiques men’s personal sense of self (traditional masculinity). No one’s entirely happy with culture, which means people can be more curious about and open to cultural critiques. Whereas, men are likely to hear critiques of traditional masculinity as a blanket condemnation of their core identity, thus resulting in a shutting down of the manhood conversation before it can ever begin. Talking about man box culture, shifts the focus to where powerful generative change is possible while also reducing reactivity. And it’s a conversation that works. As more and more men come to understand we are all victims of man box culture, change is accelerating. But my argument here is also about insuring moral integrity around the issue of diversity. When we locate the problem in man box culture, and its brutal enforcement of rules for masculinity, instead of in traditional masculinity itself, we acknowledge the value of the full spectrum of masculinities. Blaming traditional masculinity can be seen as signaling that we seek to “fix men” via the erasure of a specific segment of the spectrum of masculinities (traditional masculinity), an outcome that is neither possible nor morally defensible. In failing to clearly make this distinction, the APA has run headlong into a political buzz saw, leveraged by cynical and aggressive supporters of the very man box culture we are seeking to challenge. A more expansive and diverse view of traditional masculinity is not simply theoretical for me. 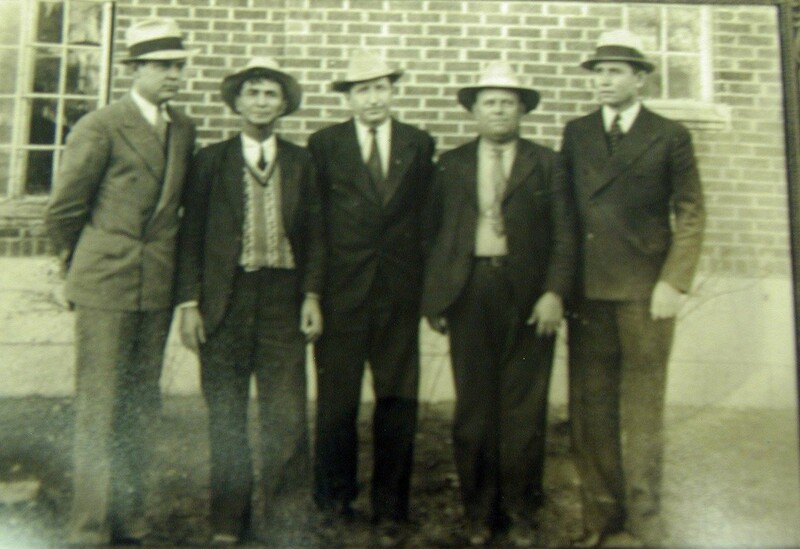 Raised in Texas, I have known many men over the course of my life who perform what might be called traditional masculinity. While they present many traditional traits such as emotional stoicism, being a provider vs. a caregiver, heterosexuality, being sports focused and more, these men have never felt compelled to force their chosen version of manhood on others. Furthermore, traditional masculinity must constitute a very wide range of masculine performances. Traditions range very widely across our diverse racial, religious and cultural communities. With “traditional men” practicing them all, how could it be otherwise? The fact is our bullying man box culture has hijacked selected tenants of traditional masculinity, amplifying the negatives and erasing the positives, creating a two dimensional caricature of traditional masculinity, the abusive enforcement of which has lead us to the dominant culture of manhood we see today. But all masculinities are being damaged and abused by man box culture, including those located on the spectrum of traditional manhood. Accordingly, it is in man box culture that the challenges for men are located, not in any one of the variations of masculinity that are under attack from it. Perhaps the APA’s disciplinary gaze makes it difficult for them to locate masculine challenges in our larger culture, which we, as men and women, create collectively, leaving them no choice but to locate the problem in our individual identities as men. But when we approach this problem from an individualizing perspective, we fall victim to the binaries around identity that some would leverage to keep us from moving forward. 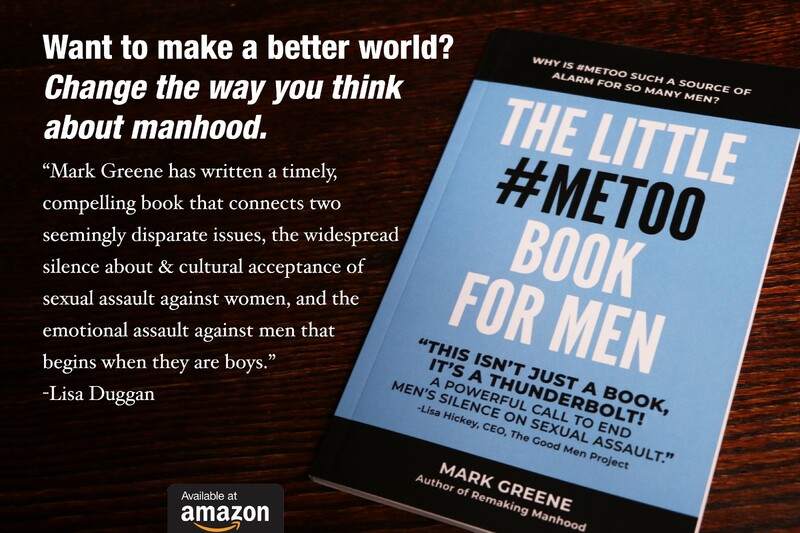 Mark Greene is the author of The Little #MeToo Book for Men. Available globally at Amazon.